SAGE India Digest: Did Tagore lean towards the performative idea of gender or the normative and traditional one? Did Tagore lean towards the performative idea of gender or the normative and traditional one? 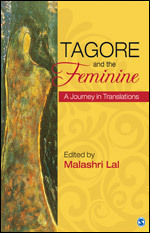 Through critical sensibilities nurtured by feminist theory and gender studies, Professor Malashri Lal in her edited book “Tagore and the Feminine” published by SAGE publications attempts to understand Tagore’s engagement with the feminine from the perspective of a contemporary reader for whom biological determinants and psychological assumptions of being masculine and feminine are questionable. Tagore’s use of androgynous principles has received scant attention—One of reasons being that they occur as subtle subversions of the patriarchal norm. This book successfully attends the subject of androgyny and its engagement with the feminine in Tagore’s work. It is constructed with the belief that in commemorating the 150th year of Rabindranath Tagore’s birth, his global and cosmopolitan identity and his contribution to intellectual history is acknowledged. Within that frame, his views on feminine along with issues of gender and sexuality deserve notice for he garnered information at home and abroad, reflected on women’s status and wrote in bold and sometimes radical ways. The author establishes the search for Tagore's engagement with the feminine as subject and agency, character and voice, philosophy and politics in this book. There is rich cultural interplay as Tagore muses over the contrasting social position of women in the 'East' and the 'West'. He relies on Indian traditions to understand them in the context of domestic ethics, marital institutions, parenting, empowerment, aesthetics and gender politics. The book includes new translations while presenting fresh insights into previously published works. Pick your copy to read more.